DECEMBER 13 AT 7 P.M.
(Silver Spring, Md. 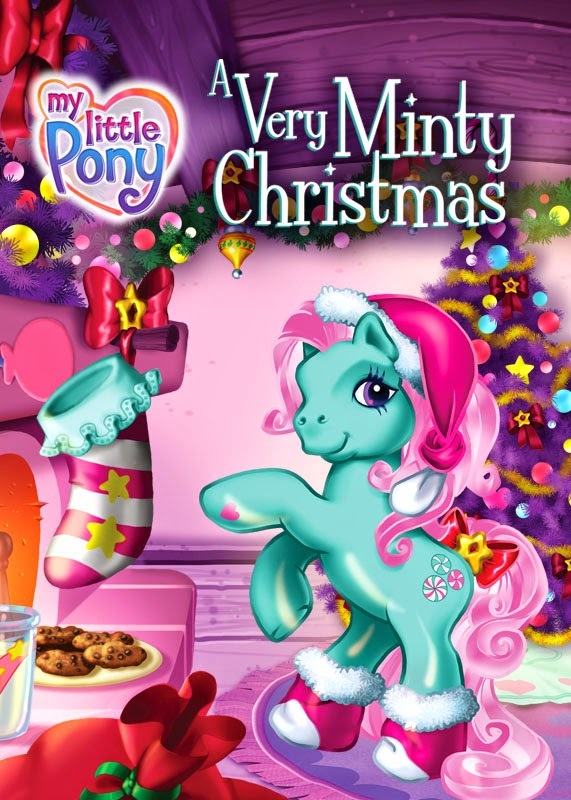 and Pawtucket, RI) December 2, 2014 – Discovery Family, the smart entertainment choice for families, is premiering MY LITTLE PONY: A VERY MINTY CHRISTMAS on December 13 at 7PM ET/6 PM CT, kicking off the channel’s holiday programming line-up. The one-hour animated special features the whimsical and colorful MY LITTLE PONY characters in an engaging, heartfelt holiday adventure that will delight fans of all ages with its soon-to-be classic Christmas songs ("That's What I Like About Christmas" and "Nothing Says Christmas Like a Pair of Socks") while subtly imparting a message of the importance of honesty, friendship and team work. MY LITTLE PONY: A VERY MINTY CHRISTMAS opens as the residents of PONYVILLE, each with its own unique name and interest, prepare their village for Christmas. The Christmas tree is decorated and its centerpiece, Here Come Christmas Candy Cane, is a glowing beacon which leads Santa Claus to PONYVILLE. Minty (voiced by Tabitha St. Germain), a rather clumsy pony, decides that Candy Cane is slightly crooked, but when she attempts to adjust it, it falls to the ground and shatters. Fearing that she’s ruined Christmas for her friends, she tries to tell PINKIE PIE (voiced by Janyse Jaud) about the accident, but can't. So the ever positive Minty decides that she must take matters into her own hooves to remedy the situation. First, she tries to play Santa Claus, delivering presents to the other ponies, but this doesn't work. Believing her only choice is to personally guide Santa to PONYVILLE, Minty takes one of the PONYVILLE hot-air balloons and heads for the North Pole, but will she make it and save Christmas for her friends? Since its debut in October 2014, Discovery Family has grown its viewership by double digits in daytime, attracting children and their parents to Hasbro Studio’s popular animation programming, including MY LITTLE PONY, LITTLEST PEST SHOP and TRANSFORMERS RESCUE BOTS. Available in nearly 70 million U.S. homes, Discovery Family is a joint venture of Discovery Communications and Hasbro. The smart entertainment choice for families, Discovery Family offers award-winning children’s animation programming in Daytime with the highest-quality, real-world content that appeals to the entire family in the Natural History, Adventure, Animals and Science genres at night. Hasbro Studios is responsible for entertainment brand-driven storytelling for Hasbro across television film, commercial productions and short-form content. It develops, produces and distributed TV shows based on Hasbro’s world class brands, including TRANSFORMERS, MY LITTLE PONY, LITTLEST PET SHOP and FAMILY GAME NIGHT. Many of these shows air on Discovery Family Channel and on networks in more than 180 territories globally. Since its formation in 2009, the studio has received nine Daytime Emmy wins. On the film side, the studio has developed and produced a number of features based on Hasbro’s brands. In addition to partnering with leading studios, the Company intends to make movies based on new and existing Hasbro brands for audiences globally through the Allspark Pictures film label. Films in development or planned for release, including OUIJA (Universal), CANDY LAND (Sony), G.I. JOE 3 (Paramount), JEM AND THE HOLOGRAMS (Universal & Allspark Pictures), MAGIC: THE GATHERING (21st Century Fox) and an animated featured based on MY LITTLE PONY (Allspark Pictures).